Whether you want to install a swimming pool heater for your recently built pool or upgrade an old one – Jandy pool heaters can be a great choice, especially knowing that gas type is the most wanted and cost-effective solution. Buying swimming pool heaters is not an easy task. Especially when you don’t know what to look for and expect – you may eventually buy a product that does not deliver what you need. Luckily for you, Jandy pool heaters are widely available and providing outstanding quality in every way. These gas pool heaters will promote faster yet more efficient heating capacity than other types, and many other brands and models on the market. If you want to learn more about Jandy pool heaters, then keep reading and find out! Whether you live in the warm south or colder north region, Jandy swimming pool heaters are at your disposal. They are able to heat up your pool in a short period of time, without problems. Simply start the heater up and let it do its work. What Do Jandy pool heaters offer? Jandy specializes in gas pool heaters. But all of these heaters are extremely efficient and environmentally friendly despite using fossil fuels. The thing about Jandy pool heaters is that they are different from each other, so each person can pick the right heater according to his/her needs. For anyone who wants a product that delivers excellent heating capacity while keeping NOx emissions low – the LXi heater is a nice option and worth checking. Not only it helps to produce less NOx, but it also makes it easier to use thanks to its AquaLink control system and superior interface. What’s more, it offers magnificent reliability and keeps the temperature in check with “Maintain Temperature” function – so you can enjoy a warm pool totally stress-free. You may find this heater in models from 250,000 up to 400,000 BTU – perfect for medium and large sized pools accordingly. The smallest and lightest design with superior installation ease, the JXi will still keep your pool warm enough thanks to its BTU availability which is from 200,000 up to 399,000 BTU. You won’t have any problem with this heater, and it will still keep NOx emissions low. In addition, you get the VersaFlo Bypass technology, which makes the JXi be much more energy-efficient by increasing savings up to 20%, offering automation of flow bypass valve, and reducing plumbing costs while installing and reducing the footprint in the long term. It will also provide a top-notch shell for better durability & resistance, as well as an excellent ventilation to keep the device working for hours straight. One of the oldest Jandy pool heaters, the Hi-E2 can provide an outstanding efficiency and performance for up to 20 years without problems. Proven to be a high-quality, reliable and durable device, it is also one of the smallest and easiest to install in the market. This heater offers up to 399,000 BTU and can promote excellent efficiency with 33% less footprint than others and an overall heating efficiency of 95%. Thanks to its small design, you can fit it almost anywhere you want, and no matter where, it provides the perfect heating start-up – faster than most heaters out there. All Legacy models are economical, easy to install and use, highly reliable, durable and still provide high efficiency and top-notch performance. The construction of these Legacy heaters is superb, and come in three different BTU models – 250,000, 325,000 and 400,000 BTU. The model also comes with both electronic ignition devices or millivolt standing pilot so it fits any user’s needs. Also, it’s perfect for both in-ground and over ground pools, all year long thanks to a superior effectiveness. Top selling Jandy pool heaters – which one to buy! The main purpose of the LXi is to provide highly efficient heating capacity that keeps your NOx emissions low. Thanks to a C-Fin heat exchanger, the heating process is faster and demands less energy to produce huge quantities of heat. Its fan-assisted combustion keeps the performance on the right lane at all times. The black-lit display helps to use the device conveniently, and with Zodiac controls, changing the modes, heating level and more – user-friendly. And of course, AquaLink controls with automation system are simply amazing. Among many highlights this device has, we can name a few such as the quiet operation for a much more comfortable experience, the excellent heating capacity, and an easy-to-use interface with straightforward controls. Many users also loved the Spa/Pool switch which adds more convenience to the device, and its excellent ability to stop freezing when the temperature is too low. On the other hand, some users complained about the device not being as reliable as expected. Even though it wasn’t the rule, a few users received a heater that stopped working every few months, and sometimes needed expensive fixes to repair. 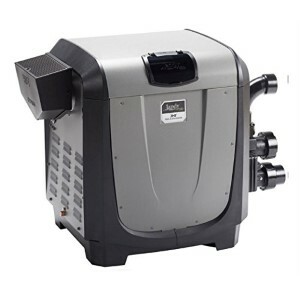 One of the smallest heaters in the market the JXi is a high-efficiency natural gas device that keeps your costs low and your pool warm. Perfect for its efficiency and ease of use, this heater is also one of the most comfortable to install for in-ground or above ground pools. Boasting a copper heat exchanger and a stainless steel burner, the performance of this heater can blow up your mind. At 400,000 BTU, it can heat up any pool in just a couple of hours. And of course, it still offers a highly durable and resistant housing, despite having a light and convenient design. Even though it needs professional gas installation, the device is very easy to install according to most users. Its performance was also well-received by customers, and thanks to a compact design, most users could fit the device in different places without affecting the looks of their homes. There weren’t many complaints about the device really, apart from being slightly complicated when it comes to gas installation. And despite that, the technicians didn’t charge much for the gas line, which ended up being a lot more affordable & straightforward than other options. Why choose Jandy pool heaters? Established as a brand back in 1958 and later joined to Zodiac pumps in 2007, Jandy has been a magnificent developer of some of the best products in the water system devices. Today, it develops everything from pumps to filtration systems, valves, and much more. When it comes to swimming pool heaters, there’s no doubt it delivers exceptional quality. Known for their efficient performances and convenient designs, all Jandy pool heaters provide the excellence you need. Easier to use, comfortable to install, cost-reducing, durable, reliable and highly resistant – that’s what you get with one of these water heating devices. So, what are you waiting for? Leave heat pumps for others, and get one of the best gas pool heaters only Jandy can offer. You won’t regret it!